I rarely post to wordpress blog. Infact this was just a backup of MSN spaces which was discontinued. Please visit http://bschandramohan.blogspot.com for more of my blog posts. Captivating story line with good acting and impressive visuals. Different movie compared to the run of the mill love stories currently – This has Ramcharan and Kajal playing lovers in 2 different eras. When I heard initially that it would be a rebirth story, I felt nostalgic about how it would shape up but seeing the movie made me completely reverse my opinions. The story starts impressively with Ramcharan (as Kaala Bhairava) and Kajal the princess talking in their dying moments. They are reborn as Harsha and Indhu. Read many comments that the next 30 mins to 1 hour in the new world is boring, but the pair’s bubbliness makes that enjoyable too. I would have loved Chiranjeevi to have done something different though. I always enjoyed the spontaneousness and effortless dance of Chiranjeevi and hence seeing Ramcharan dance was little bit anticlimax. The steps were great and he is a fabulous dancer, but you get a feeling that he is trying too hard to get the tough steps correctly which shouldn’t be how dances are picturised :). The villain does great job of his part and deserves the brickbats he receives :). Rebirth – Special effects on Ramcharan touching Kajal’s fingers can be termed as cinematic liberty though some of the sequences like jumping off the rooftop to reach helicopter and the final sumo bouncing to reach the helicopter are definitely aberrations that could have been avoided. Two scenes that highlight the entire movie are with Ramcharan as the warrior getting saved by his horse and the other one where he fights 100 Sher khan’s soldier’s single-handedly (reminiscent of the movie 300 with narrow passage and the fights that take place). Sheer brilliance !!! 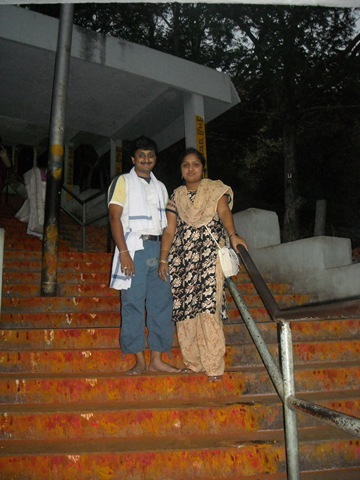 Last weekend – Saturday – had been to Sai baba temple and Nandi temple on Dodballapur – Chikballapur road. Not to be confused with the Bull temple in basavangudi. It’s in the Nandi village right below the more famous Nandi Hills we had been to last to last weekend. It’s now called Bhoga Nandishwara temple, and has idols of Bhoga Nandishwara, Ugra Narasimha and Arunachaleshwara. An ancient and very beautiful temple – you can definitely feel the calm presence of god in such places :)… I really would like people visit it more often than the other newly architected modern malls kind of temple. We also visited Vrudhashrama – with Sai Baba temple and a basavanna temple on the way back. Sunday was more adventurous – we planned to goto Nelamangala – Vishwaroopa darshana temple. Since it was only around 36 kms from dodballapur, we thought we should be able to get back in around 3 hours and hence left around 3:30 PM. This was one of the nightmarish road that I had ever travelled on – a road which didn’t exist infact. After doing all circus on my bike on the muddy road, we reached madure, another small village which has this famous shani temple. We thought we will take a break and visited it. we spotted a small temple on a hillock as we continued our journey – Guddada AdiShakti temple. Climbed upon the hill and visited that too. Found that there was a drivable path to the top after reaching the top. Another temple we covered on the way was Jai Santoshi ma temple – recent one with some north indians settled there perhaps. Anyway, after lot’s of tussles we finally managed to reach Nelamangala around 5:45. We had dosa in a small restaurant near the bus stand and set for Vishwa roopa darshini in Vishwa Shanti Ashram which is around 6 kms from the town on the Bangalore highway. we spent little more than an hour there – visiting various temples – rama, anjaneya, all avataras of lakshmi temples, Vittala Statue, Arjuna – Krishna chariot and finally the large idol of Krishna’s vishwaroopa. Wasn’t as well maintained as expected – could see cobwebs all over the roof of the building which has the main statue. But it’s good place to spend an hour or more there. Mom had prayed that she will get me and Pallavi to MelMarvathur (Om Shakthi) temple after marriage. Again, I wasn’t too keen, but had to… initial plan was to goto chennai and then visit this and spend remaining of the weekend in Chennai. But as we enquired about details, we came to know that going via Thiruvanamalai is better and we can visit Vellore while coming back. So we left early at 5:30 on 7th March, and then headed to the Thiruvanamalai. Stopped over at Krishnagiri to have breakfast. Reached Thiruvanamalai at 9:45. Booked a room in Hotel Arunachala which was supposed to be the best hotel there. MelMarvathur was about 100kms from thiruvanamalai but the route was supposed to be good. So we left immediately after having breakfast and we reached around 11:50. saw the temple, prayed for sometime and headed back to Thiruvanamalai. Reached at 3:00 – had lunch, and then went to Girivalam (the route with temples all around the base of the hill). After visiting few temples around the hill, (we missed most thinking we will find bigger ones).. we went to the main temple – since I misjudged the queue, didn’t take the special darshan tickets and hence had to spend considerable time in the queue. But we had a good darshan and came out at 8 PM. did some shopping, had dinner and slept off. Got up in the morning, visited the temple again – visited girivalam again and more temples this time. We also met a famous sadhu who predicts and gives blessings. Then left 4 Vellore. Visited the golden temple there (in sripuram). All splendor – the interesting part is the way they have explained why spending so many crores (6000 crores) on temple makes more sense than removing the poverty of so many places. We took special entry tickets of rs 100 each to avoid the queue. There were interesting slogans all the way to the park. Pallavi was disappointed that we didn’t take a special pooja ticket, but I somehow don’t get a feeling of god in such grandeur temples. Temple was beautifully done and the god’s statue was good. The swami (though male, called as Amma) was with the god everywhere. After darshan of god and a Puttu in front of this temple, we headed back to vellore. Visited the Vellore fort and temple inside. Last time I went was with my family – grandma, dad, mom, lathakka, kavi and a small small divi :).. I reluctantly had to agree and decided on a Saturday and Sunday with Pallavi’s parents and brothers. We left on friday night by KSRTC Airavath -11:30 bus and it reached at sharp 4:30. We checked into a hotel in Tirupathi and got ready and headed to Ticket counter to get the tickets. We were able to get the Archanananthara darshanam tickets for next day morning at 4 Am. Booked a Innova and saw few temples around: Kaanipaakam (Lord Ganesha’s temple), Srinivasa mangapuram and Alamelu Mangapuram. Food was okayish in tirupathi. After visiting the temples, we decided to start the climb to the top of Tirumala where the world famous Lord Venkateshwara resides. So we started around 6PM, so it was chill and we won’t be sweating much. Pallavi’s bro Bharath had climbed previously in 2.5 hours and Pallavi was saying she had climbed it in 3.5 hours. For record, this was bharath’s 6th, Pallavi’s 3rd, Pallavi Mom’s 5th I think :)… I was thinking I could ape their speeds and we should be done in 3 hours time. The initial climb is difficult with steep steps and the first 1700 steps are continuous. It was a hard task and I was drained out before I could complete that. Took a long break – had juices, hot bajji (they tasted so yummy after the tiring climb), took a long breather and then started. The climb after that was less tiring in that number of steps were less, but the walking part too was draining out the feet. Luckily there were places to wash our face and legs, the cool water hitting the burning feet was like drinking amrutha … okay bad analogy but that was really refreshing :). There was some deer park in-between where we fed some carrots and food items. Patent application approved for filing! Thought will share this info with all of you . … One of the patent applications I posted in our site got approved for next level and is in the process of filing with US Patents. Hopefully, this will be the first of many to be done! Road humps… without signs and white markings? Are you a “safe” driver like me ! – checking all the traffic signals around and making sure you follow most (the rare cases of starting off even though the light just turned from Red to Yellow fearing the constant honking behind, or not stopping when lights turn from green to yellow fearing others behind you ramming into your vehicle)? If so, you would definitely dread this one too. . u see a road hump and slow down. Invariably the vehicles behind you don’t notice that… drive damn close to you OR just screech halt next to your vehicle and bad mouth you OR just hit your vehicle… . Problem seems to be that most of these humps are bizarrely put up by some person not approved to put that up – just to make their apartment entrance safe! or just to make people look at their shops while they slow down… Also most of this humps have no kind of notice to drivers … they are without any white paint markings over the hump or any sign board near to signal the drivers to slow down. This has to definitely change and something has to be done.. . Just where to start is the question? Nope.. .not posting the story here.. . don’t know how come some websites can list the entire movie. .the turning points of the movie and even the climax… gosh.. that makes it so thrilling… :(… So you want to read the story with spoilers, then check below site, else just google it out. My view of the movie: didn’t go with too much expectation… so it turned out to be a good one. Good to know the major technicians from Mungaaru male were doing jobs for this movie too.. music and cinematography were really good. The picturesque location were really breathtaking! Feel really good seeing Karnataka’s coastal areas highlighted so well in this movie. The lead actors Kiran and Suhasi, though both debuting in this movie, have done excellent. Look cute and apt for the role. Story goes smooth and good time paced though dragging in few small parts. And the fact that “diary” doesn’t really belong to the heroine makes the movie real compared to bizarre love stories where all sorts of connections happen with message “True love triumphs!” ..All in all, a good timepass movie… laugh a bit, hummnnn the songs.. enjoy the sceneries. . .cherish few good scenes and come out smiling. . .I am happy with such movies and definitely this fills in that slot !